The Reo is a very unique kite in our line up, designed specifically for wave riding with true surfing at it’s heart. 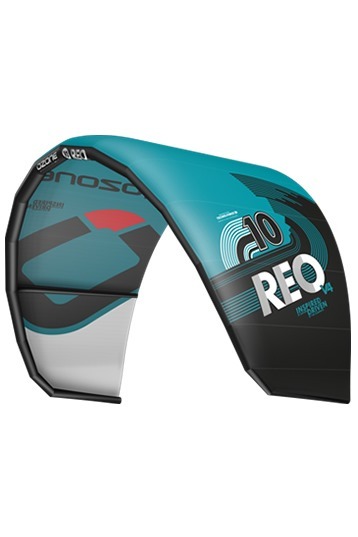 Since first introducing the Reo we have had nothing other than positive feedback and it has become the iconic surf kite. Behind the scenes we have been continually developing this model looking to improve it’s overall performance for wave riding. We believe in freedom on the wave to take us closer to a true surfing experience. To achieve this we have to combine many aspects of kite design to develop a kite that has huge depower, smooth fast direct handling, float when slack lined and perfect drift for down the line and onshore riding. The modifications to the new Reo have allowed us to improve stability and float, whilst maintaining controlled depower capabilities, this allows the rider to depower to the point where surfing is closer to reality rather than being powered along a wave. The root chord has been slightly increased delivering consistent power to get around sections in the wave, whilst easily floating down the line when need be. With fast direct handling and improved low end the Reo allows the rider to maximise power in onshore conditions when the wave can ‘push’ downwind. Hooked or un-hooked the Reo performs to any given task in the waves. For unhooked riding simply trim in slightly with the de-power cleat and the Reo will sit and fly perfectly, floating with the rider making it easier to line up that next section. Another key aspect when building a kite specific for wave riding is the strength to weight ratio. As with all our kites we use top of the line materials and combined with our very own factory quality is second to none. The Reo is designed tough without the need of unnecessary cosmetic items which only add weight and drag which reduces performance. New sizes complete the Reo line up offering more selection for those critical rider preferences. Power to size ratios have been refined and we now have more power per size. For example a rider enjoying the original 8m would now feel similarly powered on the new 7m. Be sure to take a test ride on the new Reo, here at Ozone we think all will be stoked with the performance and capabilities allowing you to push your wave riding to the next level. Great wave kite. We liked this 6m in its high and low end. The 6m size will do besides your 9m. Its a well balanced wave kite. We really liked the 6m Reo for its overall impression. Well done! The Ozone Reo had a short de-power stroke and the best overall de-power. The Reo reacts fast and is easy to relaunch. In its low-end (12 knots) the Reo has the intention to back stall, especially in the lower positions of the wind window. A bit more wind and this is gone. For beginners its harder to control, advanced kids will love the light bar feel, its high end and de-power! The Reo is a special wave kite so we took the 6m it out in a big storm. Great high end in 30/33 knots. Controllable, tip turn, trustful and fast with no crazy canopy changes that will surprise you during riding full power or depowered. In 25+ knots the total depower always holds a little bar pressure. So you got always feedback. The drift is pretty good, because its reacting fast you can easily steer it away if you are going to much downwind. The Kite is great for waveriding. With the storm conditions that we had it was the perfect setting. Not a lot of barpressure in combi with a direct quik stearing is this kite perfect for the allround who is specialized in waveriding!